Chicago is 30 degrees colder than Anchorage, Alaska, on Tuesday, as the Windy City more than lives up to its name with life-threatening and potentially record-breaking cold temperatures. 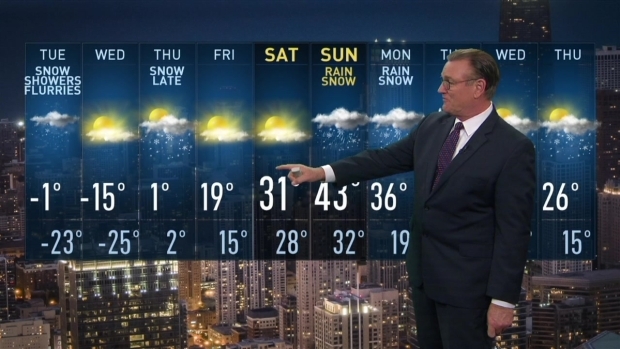 The highest temperature reached in Chicago Tuesday was before dawn, when it was 8 degrees. Temperatures began plummeting Tuesday morning, with a daytime high of just 3 degrees expected in the afternoon. In contrast, the daytime high in Anchorage is a balmy 34 degrees - meaning it's expected to be more than 30 degrees warmer in Alaska's largest city than it is in Chicago. A Wind Chill Advisory is in effect for the entire Chicago area, including northwest Indiana, until 6:00 p.m. Tuesday, when it becomes a Wind Chill Warning. The Wind Chill Warning lasts through Thursday at 12 p.m., with dangerous wind chill conditions expected. While the daytime high may reach 3 degrees in Chicago, the temperatures will plummet in the afternoon and evening. Winds of 10 to 20 mph, and gusts of 35 mph, will create wind chill readings between -20 and -35 degrees on average. But that's still not the coldest Chicago will be this week. Overnight, temperatures drop to -18 in the city and -25 inland by dawn, with wind chill readings between -45 to -55 across the area. The life-threatening cold in Chicago continues into Thursday, as temperatures in the morning are forecasted to be between -20 and -30 with little to no wind. The afternoon becomes cloudy and less bitter with light snow developing, and highs reaching -5 inland to 5 above in the city. Temperatures finally climb above zero Friday morning, recovering into the teens by the afternoon. The weekend ahead is a recovery with highs into the mid-30s and even low 40s, much closer to the tropical conditions in Anchorage.